The Locally Owned Solar Company Sonoma, Napa and Marin Trust! Looking for Solar Installers in Sonoma County, Napa County or Marin County? Solar energy is becoming more popular today. From saving homeowners money to being better for the environment, there are endless benefits to investing in solar energy solutions. But it is important to install solar energy solutions correctly for peak performance. This is why you should trust only the most reliable solar companies in Sonoma County, Marin County and Napa County. 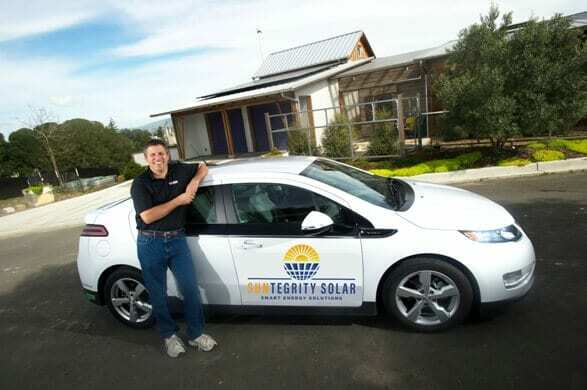 Suntegrity is a top-rated provider for Marin, Napa and Sonoma solar installation needs. We provide both residential solar and commercial solar energy solutions. We use only high-quality products, and offer design, installation and financing. Get an expert consultation with one of our Solar Advisors. We’ll answer your questions, review your options and provide an estimate–at no charge or obligation. A+ rated BBB, 5-star rated on Yelp, member Solar Sonoma County. Owned by father and son team with engineering degrees. Full-service solar installers. Construction company class B, C-10 and C-46 licenses. Strong focus on educating and informing you. We listen and present options—no hard sell. Recommendations are based on your goals—not ours. We specialize in aesthetics—no ugly conduit on your roof. Get Solar Tips. Sign up for Our Mailing List. Enjoy clean, alternative energy and cut your electric costs! Learn how this solar company helps homeowners by making solar easy. Put solar to work for your business. Improve the bottom line and demonstrate your company’s commitment to a sustainable future. Learn about our financing options that can help you benefit from your residential or commercial solar system now with tax incentives and loans. If you own a swimming pool, you can cut your utility costs and enjoy maintenance-free heating. Discover how solar heating beats gas or electric. Our team takes pride in knowing we provide our customers with reliable and reputable services for their solar needs. Suntegrity Solar understands that not every solar project is the same—and we strive to ensure that your solar project is handled efficiently and effectively. We offer a wide variety of services, including both residential and commercial solar power, installation of electric vehicle chargers, energy storage systems, battery back-up and generators, and so much more. Whether you’re looking to add solar heating to your pool or are interested in an off-grid solar system, we’ve got you covered. We even offer financing options so you can pay off your solar installation over time. Be sure to ask about solar financing options. Our team works with you from start to finish and we always make sure our customers are happy with the end result.